Made by Kerry, Charles H in Sydney, New South Wales, Australia, c. 1884-1917. Glass negative, full plate, 'Parliament House', Kerry and Co, Sydney, Australia, c. 1884-1917. Silver gelatin dry plate glass negative in landscape format. 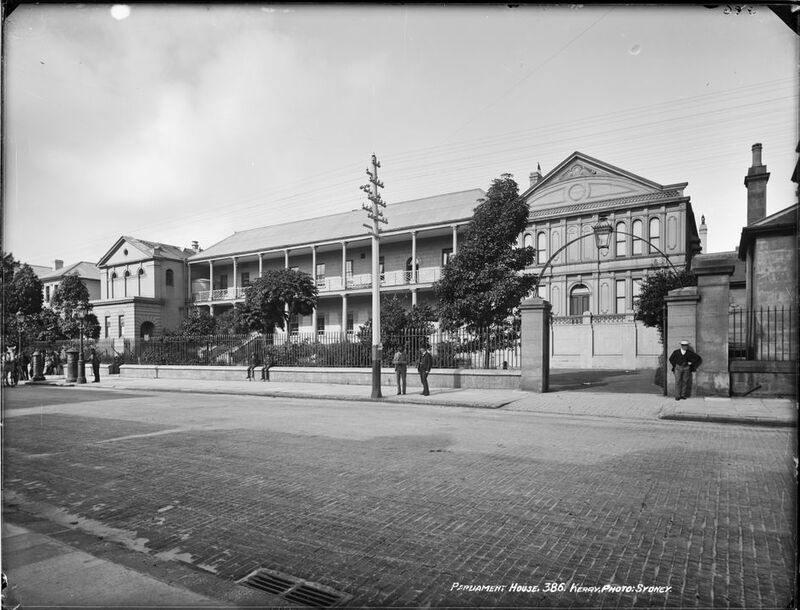 The image depicts The New South Wales Parliament House in Macquarie Street, Sydney. Parliament House is depicted in the centre of the image. The central section of the building is a two-storyed verandahed wing of the former 'rum' hospital. The two wings later added to the northern and southern ends of the building are also depicted in this image. The iron and stone fence enclosing the grounds of Parliament House can be seen in front of the building. The driveway entrance features and metal arch with a light in the centre. Macquarie Street is depicted in the foreground of the image. The footpath and road surface are paved and a drain can be seen in the gutter on the western side of Macquarie Street. People can be seen standing on the footpath and sitting on the fence of Parliament House on the eastern side of Macquarie Street. Electric / telegraph poles and cables are depicted along Macquarie Street. A horse is partially depicted near two gaslights in the centre left of the image. The caption, studio number and studio mark are inscribed on the reverse of the negative. Inscription on plate emulsion verso upper left corner, scratched by hand '386'.